There was always someone at school who had a more adventurous record collection than others. Back in the day, when vinyl was the only real medium for the serious music listener, albums would appear in school bags to be exchanged or to be played in the common room (which gives you an idea of the sort of school I attended), but would usually be the standard fare of Led Zeppelin, Status Quo, Black Sabbath, Pink Floyd, Genesis or Yes, and that, for me, was a wonderful way to acquaint myself with something new - especially on a limited budget. But every now and then something different would appear: Gentle Giant, ELP and, on occasion, Steely Dan. I'd heard some of their material before: Reelin' in the Years, Do It Again and Haitian Divorce had been played on the radio, (the latter being a minor hit in the UK) but in 1977 something a little more interesting, different, came along when someone produced their copy of Aja. The cover, in contrast to the colourful jumble of 'Can't Buy A Thrill', was stark and enigmatic. Almost completely black, save for a the red and white stripe of the edge of a kimono, part of a girl's face, and the album title in red and band name in white, it kind of drew you in, wanting to know what secret was hidden inside. What was inside was something very different from what I was otherwise listening to (see other posts in this series). 'Black Cow', the opener, is a kind of minimalist slow funk, whereas the title track, 'Aja' has a Latin edge to it, but again quite slow and languid: more of an end-of-the-night song rather than heat-of-the-moment, and that Latin edge soon gives way to some great jazz in the form of Wayne Shorter on saxophone. 'Deacon Blues', possibly the first song I'd heard on the album, has a more New York vibe to it, a little more upbeat, and quite sunny - this song puts a smile on my face every time I hear it! Some might say definitely not the 'rock' I was used to, but great music nonetheless. Side two opens with 'Peg', a dance tune (of the day), funky and rocky, with some great vocal harmonies and even a guitar solo. 'Home At Last' has almost a reggae feel alongside the jazzier elements, with some cool horns and passing classical reference lyrically to the Sirens, and a great little guitar solo from Becker. 'I Got The News' is a jumpy, stuttering little song, but none too shabby for that, again with a funky vibe. Michael MacDonald's backing vocals stand out, as do Becker's short guitar solos again. The album closes with 'Josie', which opens with some ominous guitar work, before the funk steps in again. This is a tune with class and style, drawing an album of similar quality to a close. 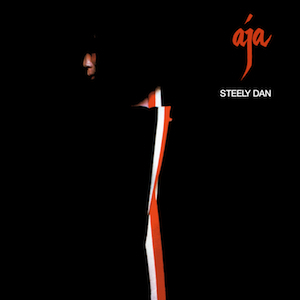 In the 40 years since this album's release I've become acquainted with the full range of Steely Dan's work, much of which is outstanding material. But this album is one I return to again and again for its sheer class, beauty and style. It can lift my heart on the darkest days, and had I known back in those halcyon days just how iconic an album it would be perhaps I would have paid it just a little more attention.